Fat-Sat pulses are short-duration RF-pulses tuned to the resonance frequency of fat. They are applied immediately before the start of an MR imaging sequence. These chemically selective pulses cause the signal from fat to be nulled (saturated) while the water signal is relatively unaffected. The Fat-Sat technique is the most widely used method for fat suppression. The popularity of this method derives from the fact that it is easy to implement, generally effective, and can be used in conjunction with virtually any imaging sequence. A clinical example is shown below. 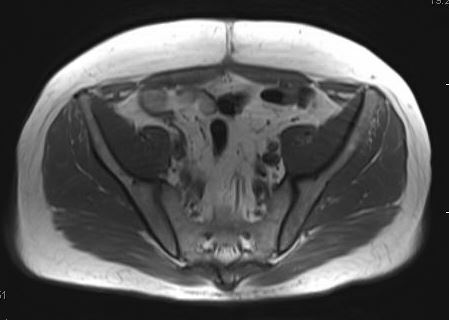 T1-weighted pelvis image without fat-sat. Fat is the brightest substance. T1-weighted image with fat-sat. Note how muscle is now much brighter than subcutaneous fat or bone marrow. The diagram right shows how signals from water and fat protons resonate in two peaks, separated by about 210-220 Hz at 1.5T and 420-440 Hz at 3.0T. The peaks are relatively broad and have slight overlap because of magnetic field inhomogeneities. Because of this natural separation in resonant frequencies, it is possible to saturate the fat peak only by applying a narrow-bandwidth RF-pulse tuned to the center of the lipid resonance. When a standard imaging sequence (SE, GRE, etc) is subsequently performed, the saturated fat protons will not generate an MR signal, resulting in a fat-suppressed image with signal only from water protons. Fat-Sat pulses are part of a group of closely related methods known as spectrally selective suppression. Other substances, such as water or silicone, could be alternatively suppressed by simply tuning the saturating RF-pulse to their specific frequencies. Spectrally selective suppression techniques are often generically referred to as "Chem Sat" or CHESS (Chemical Shift Selective) methods. 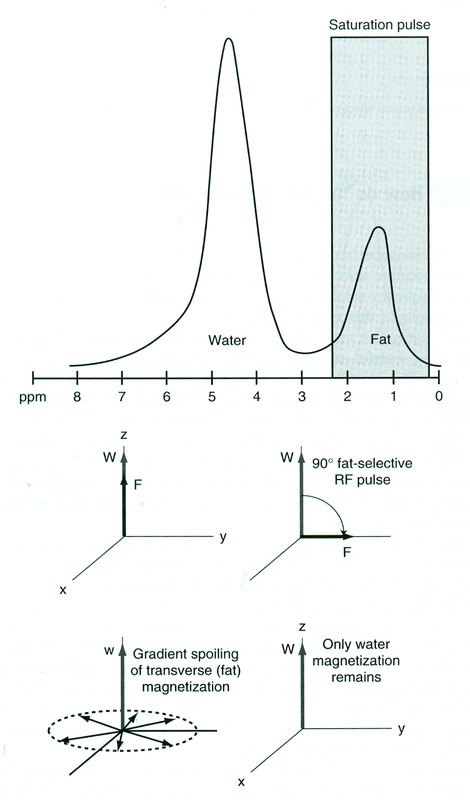 The fat (or water) peak may be selectively saturated by a narrow-bandwidth radiofrequency (RF)-pulse. Fat-Sat pulses on most commercial imagers function according to the general method pictured here. In modern clinical MR imaging, spectral fat suppression is generally performed using a homospoil technique similar to that shown right. First, a short-duration, frequency-selective 90°-RF pulse is applied that rotates the fat magnetization into the transverse plane. Immediately thereafter, the fat magnetization is dephased by application of a strong spoiler gradient along one or more axes. This process theoretically leaves only the magnetization of water aligned with the z-axis and available to participate in the ensuing pulse sequence. Typical "Fat Sat" pulse and spoiler gradient used in a GRE sequence. On most MR imagers standard fat saturation pulses are sinc-, Gaussian-, or Shinnar-Le Roux (SLR)-shaped with typical bandwidths of 200-250 Hz and pulse durations of 8-15 msec. Because the saturation pulse and the spoiler gradient take up time that would normally be used for signal generation, reduction in the number of slices for a given TR always occurs. This slice penalty may be mitigated by using RF-pulses and spoilers of shorter duration (e.g. Siemens' "Weak FatSat" option). Although fat suppression is somewhat compromised, the resultant image may nevertheless prove adequate for clinical purposes. It is also possible to save time by applying the Fat-Sat pulses at intervals less frequently than before every TR interval (e.g. Siemens' "Quick FatSat"). However, the time between Fat-Sat pulses cannot be extended longer than about 100 msec, because significant longitudinal recovery of fat will occur in that interval due to its short T1. The effectiveness of a Fat-Sat pulse depends primarily on field strength and field homogeneity. At fields below 0.3T the water and fat peaks are so close together (in Hz) that it is difficult to cleanly suppress one or the other with a chemically selective pulse. At low fields another method of fat suppression (typically STIR or Dixon) must therefore be used. 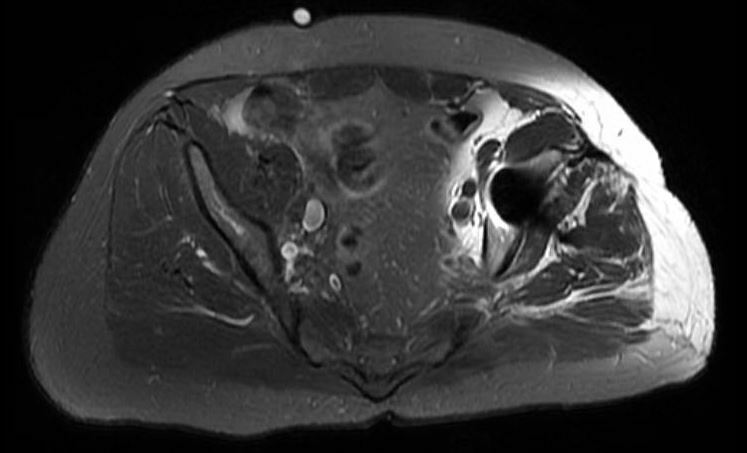 T2-weighted pelvic image with Fat-Sat. 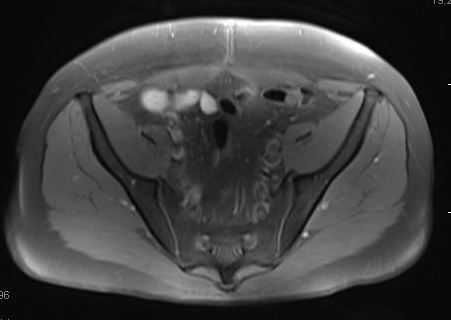 Due to a metallic implant in the hip, failure of fat saturation in a large region of the left pelvis is noted. Spectral fat suppression can prove inadequate even at high fields if magnetic homogeneity is poor. This occurs typically around metal objects, at tissue interfaces with different magnetic susceptibilities, and where significant variations in tissue shape occur. Inhomogeneity effects can be minimized by performing shimming prior to imaging or packing saturation bags around irregularly shaped body parts. In spite of these measures, incomplete fat saturation regularly occurs. Saturation bags are sometimes helpful to maintain field homogeneity and assist in more uniform fat saturation with CHESS and other chemical shift techniques. The bags typically contain a liquid suspension of a powder such as kaolin (Kaopectate™). If you don't have these special bags, a regular IV bag filled with saline is worth a try. The bags are placed at air-tissue interfaces where fat-suppression is a problem (e.g., neck, extremities). Canon's version of FatSat, called MSOFT, differs from that of other major vendors. MSOFT stands for "Multi-Slice Off-resonance Fat Suppression Technique". Instead of applying a global CHESS pulse, MSOFT suppresses fat signals on a slice-by-slice basis, thus adapting to magnetic field differences that get larger as the distance from magnet isocenter increases. Fat-sat pulses and spoiling gradients are usually applied once during each TR interval. If TR is very short compared to the T1 of fat (<<250 ms at 1.5T), however, the saturation pulse may be applied only once over several cycles. In sequences with long TRs it is possible that lipid signals may significantly recover between saturation pulses. In these situations flip angles greater than 90º may be employed. In MR spectroscopy "true" saturation methods are sometimes used. These consist of a several hundred millisecond, low-intensity RF pulse is applied after careful center frequency calibration of the fat resonance has been performed. This long-duration saturation pulse rotates the fat magnetization many times around the direction of the applied RF-field. In conjunction with simultaneous T1 and T2 relaxation, the z-component of fat magnetization is driven to zero (nulled). After complete saturation of the fat resonance has been attained, the unexcited water component can then be imaged using a conventional pulse sequence. Although true saturation methods are frequently employed in spectroscopy, they are not routinely used in clinical MR imaging because of their concomitant high RF-power deposition and increase in imaging time. Haase A, Frahm J, Hänicke W, Matthaei D. ¹H NMR chemical shift selective (CHESS) imaging. Phys Med Biol 1985; 30:341-344. Keller PJ, Hunter WW Jr, Schmalbrock P. Multisection fat-water imaging with chemical shift selective presaturation. Radiology 164:539, 1987. Rosen BR, Wedeen VJ, Brady TJ. Selective saturation NMR imaging. J Comput Assist Tomogr 1984;8:813-818.